Long story short, we're updating small tables of people with values from a very large table of people. In a recent test, this update takes ca 5 minutes to run. We stumbled upon what seems like the silliest optimization possible, that seemingly works perfectly! The same query now runs in less than 2 minutes and produces the same results, perfectly. Here is the query. The last line is added as "the optimization". Why the intense decrease in query time? Are we missing something? Could this lead to problems in the future? -- The following line is "the optimization"
Technical notes: We are aware that the list of letters to test might need a few more letters. We are also aware of the obvious margin for error when using "DIFFERENCE". It depends on the data in your tables, your indexes, .... Hard to say without being able to compare the execution plans / the io + time statistics. The difference I would expect is the extra filtering happening before the JOIN between the two tables. In my example, I changed the updates to selects to reuse my tables. The execution plan with "the optimization"
You clearly see a filter operation happening, in my test data no records where filtered out and as a result no improvements where made. The execution plan, without "the optimization"
The filter is gone, which means that we will have to rely on the join to filter out unneeded records. Other reason(s) Another reason / consequence of changing the query could be, that a new execution plan was created when changing the query, which happens to be faster. An example of this is the engine choosing a different Join operator, but that is just guessing at this point. The query is reading 550M Rows from the big table, and filtering them out. Meaning that the predicate is the one doing most of the filtering, not the seek predicate. Resulting in the data being read, but way less being returned. 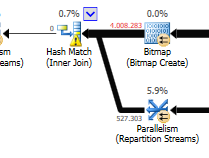 Making sql server use a different index (query plan) / adding an index could resolve this. So why doesn't the optimize query have this same issue? Because a different query plan is used, with a scan instead of a seek. Without doing any seeks, but only returning 4M rows to work with. A nested loop is best when one table is small and the other one big. Since they are both close to the same size I would argue that the hash match is the better choice in this case. What could you do to improve the non-optimized query? But due to the use of functions and this table being big this might not be the optimal solution. Updating statistics, using recompile to try and get the better plan. It is not clear that the second query is in fact an improvement. The execution plans contain QueryTimeStats that show a much less dramatic difference than stated in the question. The slow plan had an elapsed time of 257,556 ms (4 mins 17 seconds). The fast plan had an elapsed time of 190,992 ms (3 mins 11 seconds) despite running with a degree of parallelism of 3. Moreover the second plan was running in a database where there was no work to do after the join. If this is in fact reproducible when comparing like with like then the explanation is that you just got lucky in this case. Such incorrect cardinality estimations are usually a bad thing. In this case it produced a differently shaped (and parallel) plan which apparently (?) worked better for you despite the hash spills caused by the massive underestimate. Without the TRIM SQL Server is able to convert this to a range interval in the base column histogram and give much more accurate estimates but with the TRIM it just resorts to guesses. The nature of the guess can vary but the estimate for a single predicate on LEFT(TRIM(largeTbl.last_name), 1) is in some circumstances * just estimated to be table_cardinality/estimated_number_of_distinct_column_values. The IN list is expanded out to OR and SQL Server uses exponential backoff with a maximum of 4 predicates considered. So the 219.707 estimate is arrived at as follows. Not the answer you're looking for? Browse other questions tagged sql-server optimization sql-server-2017 or ask your own question. Optimizing query. FOR XML PATH or some alternatives?